Y’all, something I’ve been thinking lately, and maybe it’s crossed your mind, too…I wonder what impact our prayers have on eternity? When we randomly pray for strangers to find God—are those among the seeds watered? Does that result in souls in heaven? All because we randomly answered a prompt to pray? Honestly, I’m not sure I want to know all the whys and hows of it. I prefer the mystery of prayer. But yet—I can’t help but search for wisdom in the unknown. Interesting how God-things can be both complex and simple, all at once—with faith being the bridge that connects them. Want to up your prayer-ministry game? When reading a book—pray for the author each time you pick it up to read. When you see someone walking on the roadside—whisper a prayer for them. When you hear sirens—pray for the lives and families of those involved. When going for a walk or run—pray for the households of the homes you pass. When driving—pray for the people in the cars around you. When donating outgrown or unused items—pray for the families who’ll receive them. When passing make-shift, roadside memorials—pray for the grieving hearts left behind. Pray for your people each month on the day that corresponds with their birthdates. For example, my family’s birthdays fall on the 5th, 8th, 10th and 21st. So, I try to keep each one in prayer throughout his coordinating day. (All 12 months, not just their birth-months.) Of course, we pray for our people always, but this is another simple tool to help us stay mindful. We’ll never know the true power of our prayers—not this side of eternity, anyway. And that’s okay, because, while we humans may be a curious bunch, we can’t interpret the mysteries of Timeless God. And, what a comfort that we don’t need to know—only to trust. Tell me, friend—do you have any tips to help keep prayer at the center of your days? Great ideas to up my prayer ministry. I love the idea of praying for my family on “their” days each month…what a clever and great idea. Bev @ Walking Well With God recently posted…Whose Hand Can I Hold? I do some of these things, pray with sirens, for people I pass by etc. but I love all these suggestions! Now I’ll be thinking on this and coming up with new and additional ways to pray too. Love this idea! Thanks my friend! Needless to say, I’m doing some serious heart-searching. Thanks for all you do, Brenda. I love doing this! Praying/talking to God is second nature to me. As Paul said, not that I should boast but if there’s anything to be “boastful” about it would be of knowing God in this way! It all started on a long commute I had. Plus my husband drives a semi and I prayed all the more. With each passing semi I would pray for them, because I knew how hard it was to be on the road driving that kind of vehicle. Some crazy things can happen. It kinda spiraled into praying for passing cars. It just puts people and their needs at the forefront of our hearts and minds, and I think that is a great place to be. Thanks for sharing this, Brenda. I love your community here. Your list was so creative! Praying you have a blessed week! These are great suggestions and it’s true that we never know what impact our prayers could have. Yes, my friend. I ponder similar thoughts and typically find myself at the end of a long process with, “I don’t know. I choose to truth You, anyway.” Your tips for prayer focus are wonderful. You could add praying for those in the waiting room at your next doctor’s appointment, as well as the physicians and staff. 🙂 Thank you for helping us find focus, Brenda! I loved your ideas of ways to pray. Some of them I already do, but a few have never crossed my mind. I can’t wait to start praying. What a great idea for the birthdays. I love these suggestions. I had never considered praying for the author of the book I’m reading. Sharing on FB and Twitter, friend! Beautiful suggestions for prayer. I will certainly take your recommendations to heart and begin praying for each of the subjects you listed on your prayer list as I journey through each day. Thank you for sharing! I absolutely love these practical prayer tips. I think we tend to make prayer so much more complicated than we need to. This reminds me of just how simple (and important) it is. 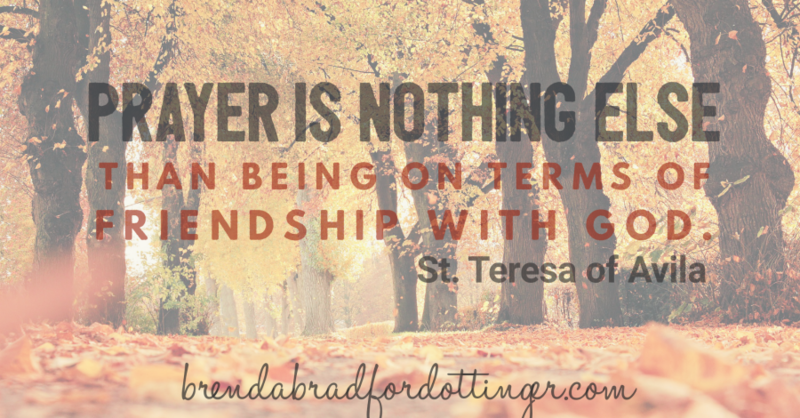 Brenda- I love your tips on praying! They make sense, wondering why I haven’t thought of them before?!? I love those practical ideas for prayer. I do some of them but I’m going to incorporate your ideas too. I read in Mark Batterson’s Circle Maker Prayer Journal that he prays for everyone he talks to throughout the day. I”m trying to remember to do that. Praying for you today. Oh and I am horrible. I just realized your book is sitting here in a pile to be mailed out. Sending it out today.